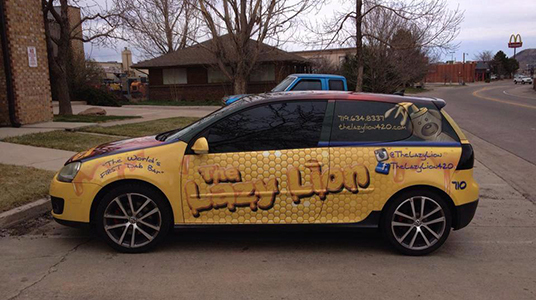 What is an advertising car wrap? Car wrap advertising is a type of marketing that is achieved by plastering an entire car with one particular advertisement. When a car has been covered in advertisements, the car then becomes a form of mobile advertising. Not only is this type of advertising simple to accomplish, but it has also proven to be highly effective. Advertising can be applied to a car by painting the car in question, though most companies choose to use vinyl decals in order to achieve car wrap advertising. The reason for this is relatively simple: decals can be removed from a car’s surface easily, while the paint is difficult to remove. Thus, more and more companies are paying to have large decals made that advertise a particular product or service. Since the invention of car wrap advertising, printing companies have come up with various types of decals that are used solely for this purpose. Vinyl decals that include air channels prevent any decal from bubbling. Further, some decals contain microscopic glass beads that prevent a decal from sticking to any surface until pressure has been applied to the decal. The portion of a decal that is placed over a window area usually contains perforations, so that passengers and drivers can see through the decal. These things were not possible when car wrap advertising first developed. Nowadays, car wrap advertising can be found in most large cities all over the globe, though some cities have banned this type of advertising for various reasons, for example, With A Vehicle Wrap You Can Communicate Anything You Want! Big Dog Wraps & Graphics uses only the finest brand name premium types of vinyl in the marketplace. Our advanced printing technology means you get a premium, high-gloss finish that emulates a custom paint job. Our company is your source of high quality, creative and affordable vehicle wrap solutions. 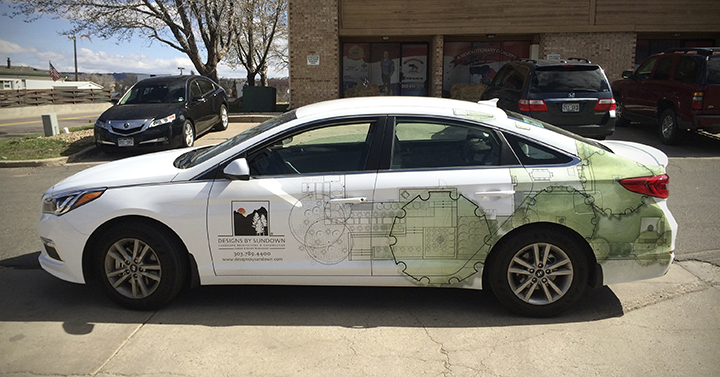 We create custom designed vinyl car wrap graphics that express our customers’ image, services, and products, from small start-up businesses to large corporate franchises in Colorado Springs CO. Come check us out personally or contact us online for a free quote for your fleet graphics and wraps. We are located at 735 Park St. Unit F, Castle Rock, CO 80109. However, if you cannot come to us we’ll come to you. You can also call us at 303-353-1101. We will also help you along the rest of the process using only the best of materials.